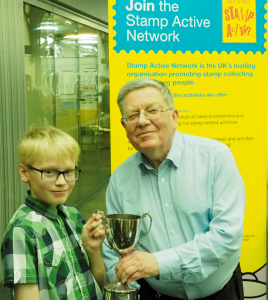 The entries in the Stamp Active Competition for Spring 2019, sponsored by Stanley Gibbons and the Great Britain Philatelic Society, were judged by Christine Earle, John Davies and Richard West, with the judging kindly hosted by The Royal Philatelic Society London. The judges were pleased to see that entrants are developing their exhibits by increasing the number of sheets they enter. The entries are shown at Spring Stampex thanks to The Philatelic Traders’ Society. The overall best entry is Philatelic Fun by Toby Middlemist, which is also the best entry in Class C. The best entry in Class B is All at Sea from Filip Middlemist. The Schools Trophy is awarded to Neyland Community Primary School.